I love your Off the Rail Quilt. It's so bright and fun! I love the top three on the left, that look almost but not quite like dots! 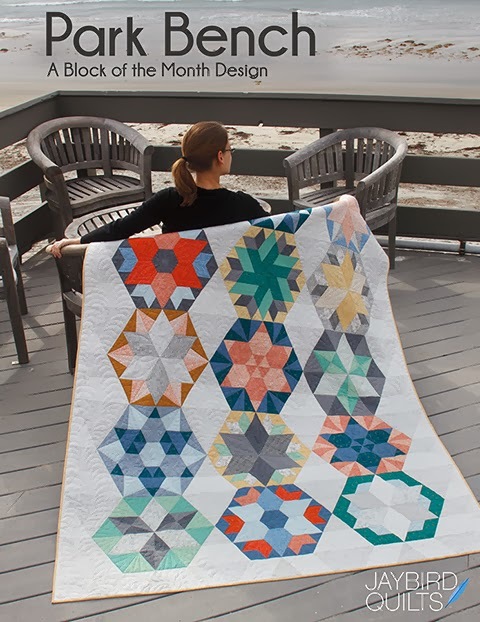 Your pattern is perfect for this collection! Oh so hard to choose! I love the red! Just posted to facebook! woohoo! I love the red print with the large flowers. With it being spring-time in the US Northeast, I can't seem to get enough of flowers. Its not quite warm enough for a lot of flowers to be out, but the green shoots are poking through the ground and its a great teaser for what is to come in another month or two. got you on my blog..thanks for the chance. I like the blue flowers on white. All of the reds are my favorite - particularly the red with the bold orange flowers! These look great in this quilt pattern. So fun Julie! my favorite pattern is the large blue floral in the second row. So pretty! Posted on my FB page! Thanks for the chance to win such pretty things! I'm a red fan! Such fun, crisp fabrics. My favorite print is the flowers with shades of blue and yellow. Love your pattern too! I had to see the whole thing to figure the pattern out, and I absolutely LOVE that in a quilt. Great giveaway Julie! I have been eyeballing that pattern of yours since you first posted it wondering when I would find the time to make it so I could justify buying it! My favorite prints are the red, orange and green ones on the top right, so bright and bold! I love the blue and green fabrics. I'm due in eleven weeks with my baby girl and I think that fabric would be adorable in a little baby quilt. My favorite print is the red flowers. Thanks to you and R.K. Fabrics for the giveaway! I really like the red & blue prints. But the whole collection is lovely. I love the blue floral print you used on the backing of the quilt best. 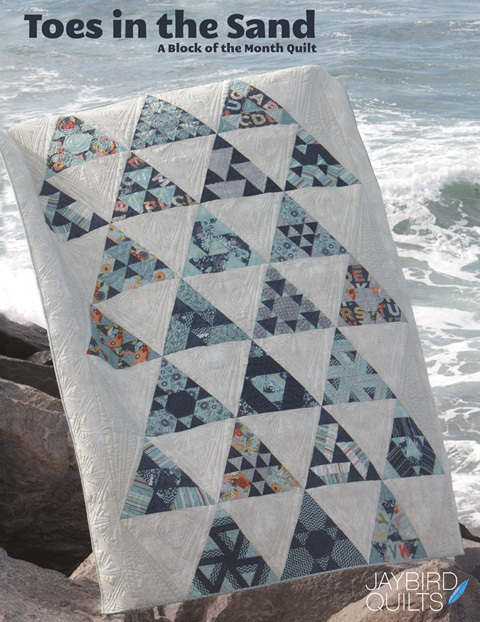 I love this quilt and would definitely use the fabric to make the twin size as a quest bed quilt. So colorful. Also posted on facebook! Thanks! really like the leaf colorway...your pattern is perfect with these prints! Love the colored flowers on a white background....very cute! Tweeted! @cjswaldner Hope I win! I love all the dots! Wow.. this looks awesome! 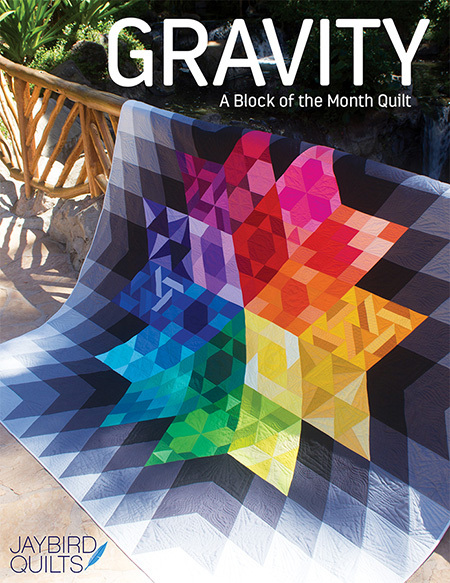 I want to make a quilt big time, and this one looks like an awesome place to start! Love all the colors of the fabric... but particularly the blues... they stand out nicely! Great job! ok my favorite is the yellow flowers middle of second row in your swatches...my favorite colors! I like the yellow in this line a lot - especially the larger floral print! I love the aqua background with the red flowers! Oh, this is such a fun line! I love the orange - looks like little oranges - its super cute! Love the orange colorway for sure. Thanks for a chance at a great giveaway. What a great giveaway! I love the flower prints in all the colors. Thanks for the chance to win. I love the red daisy flowers. My granddaughters favorite color is red so I would make her a quilt out of this beautiful fabric. love the yellows and the pattern! Thanks for a chance. I like the small flowers with blue, turquoise and yellow. I love how they all look together in the quilt! I'm loving the green with orange flowers in this collection. I love the red flower with the blue checked background. Gorgeous! Love the reds - all the prints are so bright and fun. That is a very hard choice. If I absolutely had to choose, I'd choose the leaf colorway, but I love both! 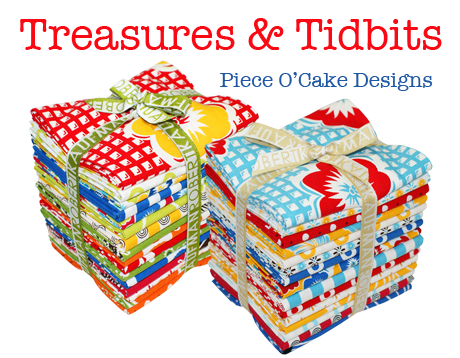 What fun fabrics--just what you'd expect from Piece 'O Cake! My favorite color? red, natch! Pick a favorite?! I will have to go with the big red flowers. It looks like it would make a really cute skirt. I love the red dirty flowers! And your rail fence quilt is awesome! I love the blues! This quilt just reminds me of our cottage. Thanks for the opportunity! I love the Marigold Color Story. 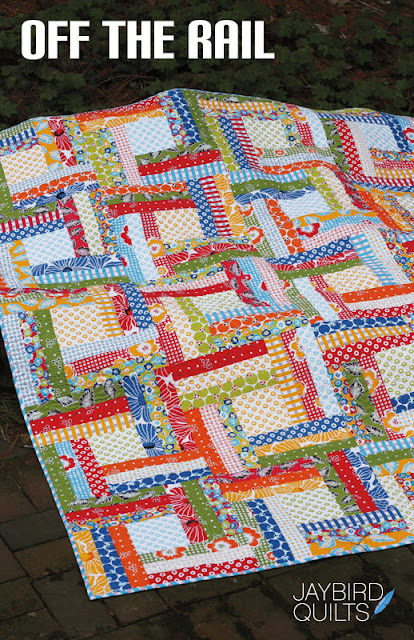 What a bright and cheery quilt! I love the color from the bottom right hand corner of the total palette---so pretty! Love the red flowers -- I need more red in my stash! I'm in love with that sunny yellowy orange-- Mainly because I think the sun and warm weather have entirely given up on every coming to the Midwest! I love the shades of orange and green in this collection. My fav would have to be the orange fabric with white dots & tiny flowers. I just tweeted about the giveaway. @otquilter. I like the monotone flowers. All colors :). TokenAsianFriend (at) gmail (dot) com. Thanks! All the reds are my favorite! It goes with everything, well, almost. I told all on Facebook! guess I am a Marigold girl!!! but both are great!! I like the three large florals the best, and probably the blue the best of the three. It looks great on the back of your quilt! I love the red flowers on the aqua background. I love these color sets coming out this year, so 40's. All of the prints are adorable! But those first three prints-the dotty ones? Those are my faves. I will have to pick up a set of these if I don't win! I think I like the Marigold one just a touch better. Oh I love the blue with the red flowers very much. This quilt is just so awesome. Makes one feel happy! Thanks for the great give away! i love the blue bubbles! I like the yellows. This material definitely compliments your quilt! Or is the other way around? I wrote about your giveaway on facebook. Thanks for a chance to win such beautiful fabric and your pattern too. Ginghams and dots gotta love it - if I had to chose just one it would be the blue gingham with the red flower - great focal to build off of. I love all those bright colors, but my favorite is the red flowers on the blue gingham. Perfect for the quilt you created! I love the darker blue in this collection it's just right for summer projects. I wrote about your giveaway on FB. Love this! What a great giveaway. If I had to pick one...it would be the leaf! I am totally loving the red and blues in this collection. 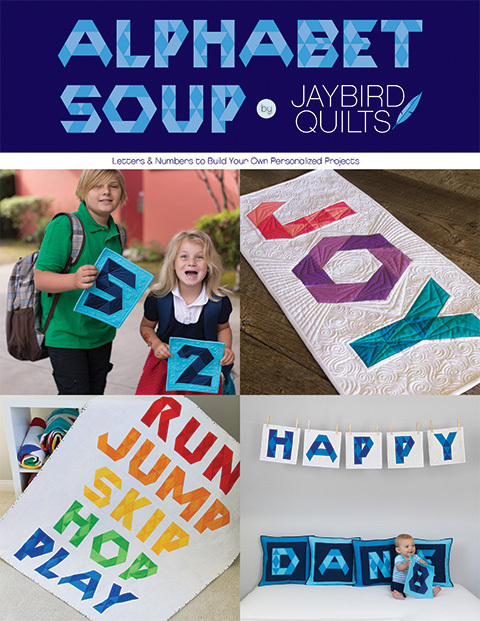 I also love the quilting pattern, it looks fun!! that's a really hard question! i like them all! but i'm going to go with the polka dots as my favorite... thanks! 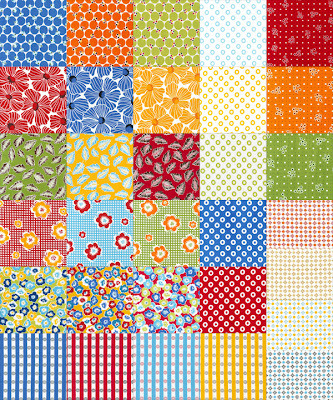 i love the mini teeny flowers the best...great fabrics, love the pattern...yeah! more fun for me. I like the blues- clean and bright. I particularly like the blue flower. My fave are the three large flower prints and I like the gold one the best of the three. Thanks for a chance to win. I need to win this! My 19 year old son asked me for a quilt and this is WONDERFUL...I love the blues...this is great! I am so pumped about this collection...it is right up my alley!! I love the big daisy prints, especially the blue one. Thanks, Julie. I love the red flower on the aqua background. What a fantastic giveaway! Thanks for the chance! i like the blue with red flowers and any of the dots. My favotites are the reds, the one that looks like gingham and the one in the upper right of your swatches. The whole line is just so bright and fun! Thanks for the great giveaway! What happy colors. Thanks for the giveaway. so hard to pick one because the colors are all my favorites, but the blue, red, yellow flowers on the simple white background is nice. All of the colors are great but I love the yellows best. These are such a fun group of fabrics. 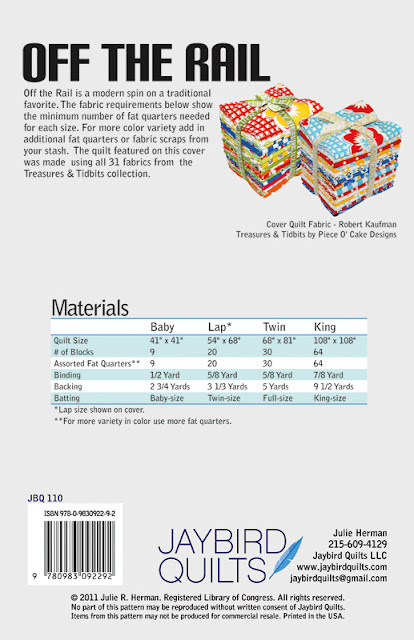 Perfect for your quilt for sure! Such cheerful fabric! My favorite is the blue flower pattern on white background. I love the red polka dot! Thanks for the chance to win. I love those marigold flowers, not sure of the name of the print, but it is wonderful! Thanks for having the giveaway! I like the green with orange flowers. I love the gingham with the big flowers scattered across it. Thanks for the giveaway! Fantastic fabric! Pick me pick me!!! That is some yummy fabric!! So bright and fun. I like the flowers on white...especially the red. Awesome quilt. I love the fabrics and the pattern is perfect for them. Great combo. I like the orange. Wow, it's hard to pick just one favorite. I do really like the one with the big blue flowers. I believe I saw it in your earlier post about this quilt - it was part of the backing. 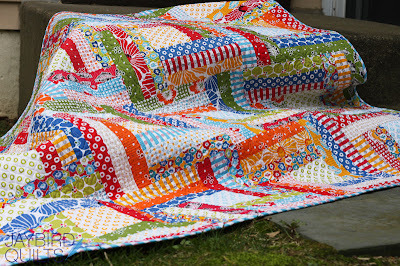 Great giveaway and great quilt! Thanks! Great giveaway and my favorite would be the little blue flower ,but they are all sweet .Thanks for the chance to win. I love the greens! These are fun fabrics. I have a love affair with reds so red would have to be my favorite!! Thanks so much for the opportunity to enter. This is a wonderful giveaway!! I love the Blue check with the big red flowers! I like the marigold color story the best. Yellow isn't a color I am normally drawn to so I am trying to stretch myself. I like the tones on tones in the right column. I posted about this giveaway on facebook. Thanks for the chance to win - though I'm definitely going to buy the pattern if I don't win it (and some of the fabric too when it comes out - I can't wait). oh so so many comments, but then who wouldn't with 2 really stunning prizes up for grabs, and they are stunning! My favorite is the leaf colorway - I love green. Thanks for the opportunity to enter your great giveaway. I have just posted this on FB, what a fabulous giveaway!! I love the red dots. Actually I love all of them and this pattern! I never win anything but I can't but enter anyway! I love the colors<all of them. the quilt pattern is awesome too. thanks for the chance to win. I love all of the yellows! hmmm they are all delightful! Every sinlge fabric is just charming, and the polka dots, well what can I say!! the yellows in this line just sing SPRING!!! I love all of your patterns!! I think that I have 3 of them. I'd love to make this quilt for my daughter's bedroom. I love the reds in the fabric collection. Fab Giveaway! I like all the red prints! I like all them! But I prefer turquoises, reds and polka dots. The blue floral is my favorite. What a fantastic collection and giveaway! The oranges by far call to me the most - so fresh and pretty! I like the tiny geometric prints! I love all of them and I love your pattern. You were smart to wait because the fabric and your pattern work so well together. Thanks for the give away! Even tho orange is my new fascination, the reds in this colorway are fantastic!! I love the oranges in this collection!!! I like them all but my favorite is the small blue print. Such fun colors and designs. I love the blues in this collection. I love all the reds and blues! Great collection of fabrics! I bet your pattern would look wonderful with these prints! I love the turquoise and red flowers. THanks for the great giveaway. I enjoy your blog. I love the greens! My favorite print is the one on the right, in the third row from the top. I like the first three prints in the right-most column. I love this fabric line--so cheery! It's REALLY hard to pick ONE favorite, such a wonderful collection, lemon/lime and a picnic on a summer day....also love the Off The Rail pattern...I especially like the aqua with little red flowers, Grandma's Apron fabric. The red just pops out at me -- it is so pretty. Thanks for the give away. I like the blue feathers on the gold background. Love the blues in this, but also the red, turquoise, green, mustard...your on the rails pattern is perfect for this!! Posted on my FB and "liked" you...thought I already had ;0!! Very nice! I love the blue flowers. What a fun giveaway! They are such bright fun fabrics! It's hard to pick, but I think my favorites are the checkered fabrics that look sort of like gingham. The Off The Rail pattern is just perfect for these prints. Blue for me! I especially love the blue flowers on the white background. I posted about the giveaway on Facebook. I'm sort of new to Facebook - I hope I did it right. My fave is the blue with red flowers!!! my favorite color/print is the blue with the red flowers. Really love the cherry reds in this Robert Kaufman fabric collection! 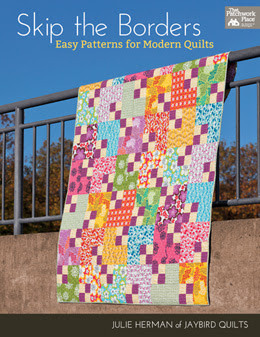 I've posted this giveaway on my business facebook page - KimHansonQuilts! Oh my! What a great givewaway! I think my favorite color in this collection is the royal blue - so nice!! I like the dots on the red background! So fun! :) Great giveaway! Thanks. AND I just tweeted the Give Away. Thanks so much for the opportunity to win! I like the blue check with the red flowers but the small floral red with blues and yellow (or is it green, my monitor is funky with colors)is a close second. I would have to go with the reds and yellows. This is a fun line of fabric. Thank you for this great giveaway. I love the red--specifically the one in the upper right hand corner that's reminiscent of bandannas. And I love that the pattern is also in King size--so rare! I love the blue, aqua, and yellow tiny flower print. I love how bright all the colors are. 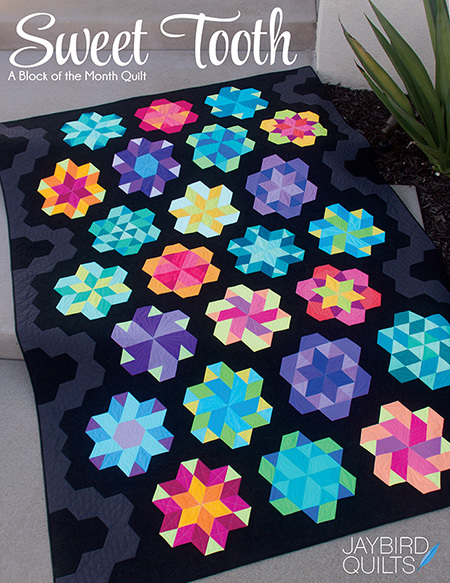 And the quilt pattern is awesome too. I love the blue/green jumble print...it's awesome! I'm drooling here! I'm not sure I could pick an absolute favorite, but as usual my tops are the greens & oranges. you're a meanie to make us pick one favorite...I love them all! But anything in orange always tips the scales for me. Thanks! I have posted about your wonderful giveaway on my blog. I love the white fabric with aqua dots. I am a sucker for dots. WOW there all beautiful but I have to say that the orange one with flowers on it I like the best. Oooh so hard to decided what colour as I love them all. Ok the greens. i would love to win this! what a happy day that would be! i love the orange dot with little flowers. so cute!